A fine and vintage sterling silver sautoir necklace c1920-30. 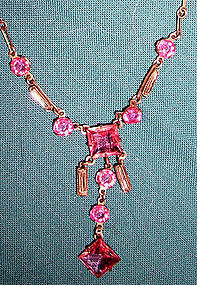 This 16-1/8" necklace has a 1-3/4" drop with claw-set pink crystal stones and bezel set white rhinestones. The pink stones are open backed and this necklace has a box clasp; it weighs 5.4 grams and it is stamped STERLING. This item is in excellent condition with no chips, cracks, dents, bends, corrosion, losses, damage or repairs. All items are thoroughly and conservatively graded and all condition issues are noted; all items are vintage or antique and may have slight signs of gentle use. Surface shipping to the U.S. starts at $6.30 (other spots may vary) - insured is higher, and mandatory on items over $95 if paid with a credit card. Items paid with a credit card will be shipped to confirmed addresses only. We do ship internationally. All of our prices are in $US. NOTE: we DO NOT accept PayPal. 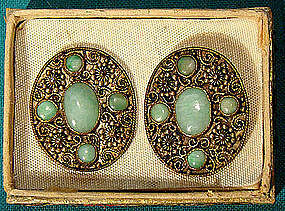 A vintage Art Deco 2-1/8 x 1/4" sterling silver bow shaped pin with high quality paste stones and crystal sapphires c1920. This pin is stamped 935, it has an unusual interlocking safety clasp, it weighs 3.1 grams, and it is in excellent original condition with no chips, cracks, dents, bends, corrosion, losses, damage or repairs. All items are thoroughly and conservatively graded and all condition issues are noted; all items are secondhand and may have slight signs of gentle use. Expedited insured shipping to the U.S. starts at $18.50 (other spots may vary). Items paid with a credit card will be shipped to confirmed addresses only. We do ship internationally. All of our prices are in $US. PLEASE NOTE: we do not accept PayPal. 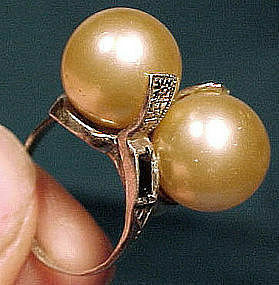 An Art Deco sterling huge twin glass pearls ring with man made sapphires circa 1920s. 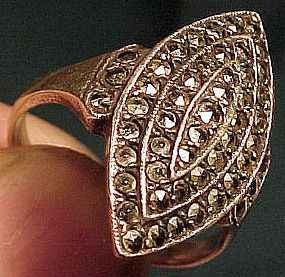 This size 5-1/2 ring has huge creamy yellow 12 mm. glass pearls flanked with baguette cut man made or synthetic sapphires in a tooled sterling silver setting; it weighs 9.7 grams and the ring is offset at the shank so the pearls sit at an angle on the finger. It is marked STERLING and it is in excellent original condition with no chips, cracks, dents, corrosion, losses, damage or repairs other than a slight bit of bending at the bottom of the shank. All items are thoroughly and conservatively graded and all condition issues are noted; all items are vintage or antique and may have slight signs of gentle use. Expedited tracked and insured parcel shipping to the U.S. starts at $19 (other spots may vary, air is higher). Items paid with a credit card will be shipped to confirmed addresses only. We do ship internationally. All of our prices are in $US. PLEASE NOTE: We DO NOT accept PayPal. An Eatons sterling & marcasite bar brooch from 1920 1930. This attractive Art Deco 1-5/8 x 1/2" bar pin has a nice openwork design, it has a safety catch, it is signed STERLING with the E in a diamond mark (for Eaton's, Canada), it weighs 2.8 grams and it is in excellent original condition with no chips, cracks, dents, bends, corrosion, losses, damage or repairs. All items are thoroughly and conservatively graded and all condition issues are noted; all items are vintage or antique and may have slight signs of gentle use. Tracked Packet shipping to anywhere in the U.S. is $14.00 - this includes online tracking, air service and insurance up to $70. Items paid with a credit card will be shipped to confirmed addresses only. We do ship internationally. All of our prices are in $US. PLEASE NOTE: We DO NOT accept PayPal. 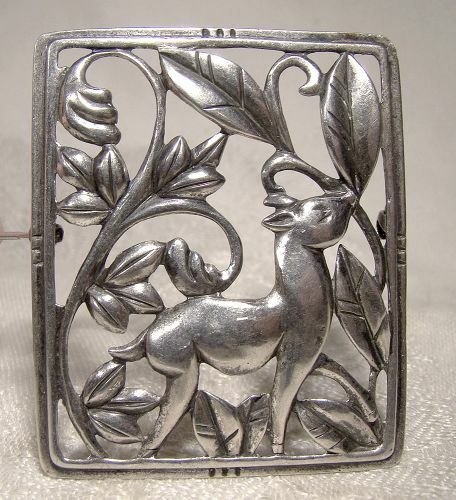 A great vintage Art Deco design sterling silver 2-1/8" x 1-3/4" brooch depicting a deer feeding in the forest c1930s-40. 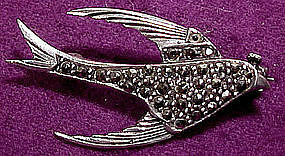 This pin features a safety catch, a true Deco style, and it is stamped STERLING with an HB maker's mark, and a somewhat scratched out Danecraft mark can be seen. Not sure how long this mark was used, but have seen this combination of a few older Danecraft pieces. Possibly Danecraft purchased some older stock from another manufacturer when it was first starting up?? It weighs 18.2 grams and it is in excellent vintage condition with no dents, bends, corrosion, losses, damage or repairs. All items are thoroughly and conservatively graded and all condition issues are noted; all items are vintage or antique and may have slight signs of gentle use. Small packet air post to the U.S. starts at $8.95 (other spots may vary) - insured is higher. Items paid with a credit card will be shipped to confirmed addresses only. We do ship internationally. All of our prices are in $US. PLEASE NOTE: We DO NOT accept PayPal, only VISA and MASTERCARD. A lovely vintage Art Deco 1-3/4 x 3/4" sterling silver brooch with marquisites and a large faceted claw-set amber crystal stone. This pin has a safety catch, and it is stamped STERLING with a GBM maker's mark; it is in excellent original condition with no chips, cracks, dents, bends, corrosion, losses, damage or repairs. All items are thoroughly and conservatively graded and all condition issues are noted; all items are secondhand and may have slight signs of gentle use. Surface shipping to the continental U.S. is $6 (other spots may vary) - insured is higher, and mandatory on items over $85 if paid with a credit card. Items paid with a credit card will be shipped to confirmed addresses only. We do ship internationally. All of our prices are in $US. 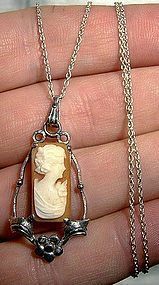 A stunning Art Deco vintage channel-set paste necklace c1930s. Country of origin is almost certainly Germany, and this 17-1/4" bracelet is 1/4" wide; the clear white round paste stones sparkle beautifully. 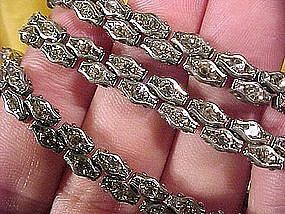 The twin rows are channel-set and have pins linking each segment, beautifully made and finished. The high quality of this piece is shown in the hidden snap-in clasp, and it has an overstamped and therefore unfortunately obscured maker's or patent mark (probably DRGM, for the German patent protection mark). This item is in excellent original condition with no chips, cracks, dents, monograms, bends, corrosion, losses, damage or repairs. All items are thoroughly and conservatively graded and all condition issues are noted; all items are secondhand and may have slight signs of gentle use. Surface shipping to the continental U.S. starts at $5.50 (other spots may vary) - insured is higher, and mandatory on items over $85 if paid with a credit card; items paid with a credit card will be shipped to confirmed addresses only. We do ship internationally. All of our prices are in $US.